This is fukutopika, Concept Exective Officer of Istpika . I am interested in Cognitive Science and I often try to do some reverse-engineering of my brain by understanding how it thinks. Recently, I had a 「Aha!」moment; I suspected that the human brain must have 2 source registers (*) but only 1 destination register. Do you remember the game console from SEGA, the "Megadrive"? 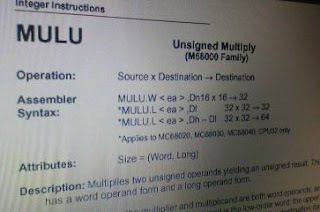 The Megadrive used to be a very advanced device with its 16-bit cpu and its 68000 Motorola microprocessor, and I was fascinated by the fact that, when programming in ASSEMBLER, you could multiply 2 registers with only 1 instruction namely the MULU instruction. You could do "D0xD1=D2" but not "D1xD2+D3". I know, you will retort that you just need to combine the 2, but still. When you do some mental calculation, I realized that you can naturally do "AxB" but when it comes to "AxBxC", that's not natural. Also, think about "1+1+2". It does not come right away, does it? You got to, first, prepare "1+1" and then do "+2". Do you manage to computer the three at once? For that reason, I am convinced personally that the operational registers in the human brain must be of the following type: 2 source registers for only 1 destination register. (*) Register: A box for the CPU to put temporarily some numerical value. The number of registers that a machine has , depends on the machine. Note: this blog post is a translation of the blog post originally written by FUKUTOPIKA, "1+1+2は難しい"